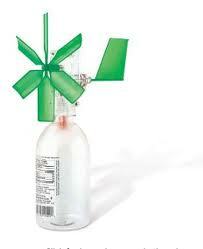 You can build an amazing wind turbine and learn about renewable energy with this Windmill Generator kit! Watch the LED light glow as it is powered by free energy from the wind. 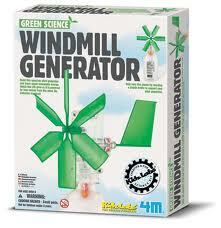 Earning the Teacher's Choice Award 2009 in Learning Magazine, the Windmill Generator is a superb gift that makes learning fun. 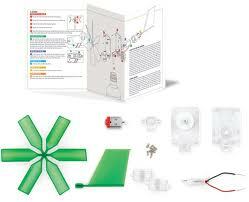 The Make a Wind Turbine kit includes an experiment guide for making a Windmill Generator that lights an LED lamp. Get some high voltage inspiration with a science game that kids will learn from and love. The science experiment contains a rotor, tail, toy motor, housing, LED lamp, screws, fun facts and detailed instructions. Learn about how we can produce wind power through wind turbines, without the need for batteries! The picture above is what's inside the box. The picture below is what it should look like once it's all put together.